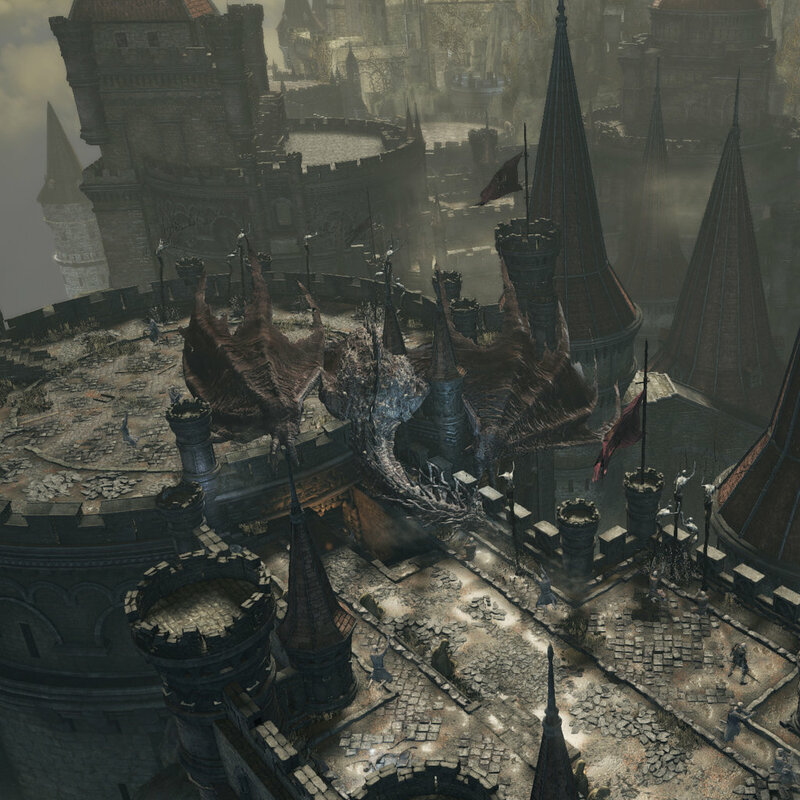 The High Wall was not constructed by traditional means; instead, it simply appeared, sealing off the city of Lothric from the world around it. The path to the Undead Settlement in particular was blocked, leading to messengers from Lothric accessing the settlement through other means, though they had no way of returning to the city. This isolation has led to complete disarray within the area; dead knights are seen everywhere, prisoners are left to rot in their cells and the city is running rampant with Hollows. In an effort to stop Unkindled from leaving the isolated city, Pontiff Sulyvahn has sent an outrider watchdog named Vordt to guard Lothric's main gate. Access to the Castle is blocked by Irithyllian forces as well, with the powerful Dancer of the Boreal Valley hiding in the cathedral. The first connected zone in the world of Dark Souls III. From here, you can head towards the Cathedral of the Deep, or perhaps traverse the swamps of Farron Keep, although not before passing through the Undead Settlement. It is possible to defeat the Dancer of the Boreal Valley and proceed to Lothric Castle, a end-game zone. However, you cannot enter the Grand Archives without defeating the first three Lords of Cinder first, so the benefits of doing so are circumstantial. Dropped by the Mimic in the tower beneath the first Lothric Wyvern you meet. From the Tower on the Wall bonfire, proceed down the stairs and the tower, to the floor with two Hollow Assassins in. Head through the exit outside, and climb down the ladder, watching out for the two Hollow Soldiers lying in ambush. Continue forward, avoiding the Pus of Man and down another ladder. Enter the room immediately in front of you and continue past the Lothric Knight, down into a cellar with several Hollow Soldiers and Starved Hounds. On top of an anvil you will find the shard. Having teleported from Firelink Shrine, head out of the antechamber you were teleported to. Outside, head down the ramparts to the bonfire. Heading to the right from the bonfire, you will encounter some Hollows and Undead Dogs. Be sure to kill the Crossbow Hollow behind you by returning up the stairs and through a broken part of the wall. Once you have cleared the rampart, head forward up onto the tower platform. You will encounter several non-aggressive praying Hollows, another Crossbow Hollow and a Pus of Man. Pick up the Longbow and 12 Standard Arrows by the praying statue. Return back down to the bonfire. Take the left path from the bonfire on another rampart and clear the Hollows on it. Pick up the Soul of a Deserted Corpse in the middle of the area. Continue past the dead dragon into the inner wall. In the first circular room within the inner wall, kill the Hollows and climb down the ladder in the middle of the room. Continue through onto a lower rampart. Kill the Hollows on the rampart and walk up the first staircase to an upper rampart. As you reach the top of the top of the staircase, a dragon will land and breath fire across the whole of the upper rampart, killing most of the Hollows. Watch out for the fire breath further down the lower rampart's path. Head back up to the upper rampart, timing your movements to avoid the dragon fire. Pick up X and X. Having survived the dragon, continue through the lower rampart and into a elevated courtyard, picking up a Soul of a Deserted Corpse on a nearby corpse. Watch out for the aggressive Lothric Knight. Head to the right into the inner wall. Once inside the wall, head to the right and pick up 3 Firebombs on a suspended plank. Head outside to the right to the Tower on the Wall bonfire. From the bonfire head to the left to pick up 1 Titanite Shard. Head back down into the inner wall and take the staircase down, watching out for the Hollows. Head down the ladder nearby to the next level. Go through the cellar, picking up the 8 Throwing Knifes to the right.